Reinvent Trenton is published to help policy makers and voters think about Trenton’s issues and how to resolve them. The site introduces new ideas, it presents data and it offers what I hope are constructive plans to revitalize the city. Quite a bit of what you read on the site comes straight out of business, economics and public policy reading that I’ve done. The idea is to interpret academic ideas and apply their central concepts to our situation here in the River City. The job is made easier when readers have a good basic understanding of economics and how cities work. There’s no point in trying to write Reinvent Trenton articles that provide this basic education when there are best selling books that do it much better than I ever could dream of. Economics isn’t really about money. It’s important to understand that. Rather, economics is the study of causes and effects in human society and the incentives that drive our behavior. I would recommend a basic textbook on micro and macro economics but why do that when there’s …. Freakonomics is a fun and provocative book that explores many of life’s conundrums many of which relate directly to Trenton’s issues. It covers crime reduction, parenting, education, government incentives and even gang life. In addition, there’s a Freakonomics movie that updates the book and covers the basics in less than 2 hours. Unless you’re already a PhD Economists you’ll be helped in the way you think about what drives a city by reading the book or watching the movie. Much of what we’ve been told about cities is wrong. This is amazing given that one of the seminal books on cities was written almost 50 years ago. You could probably read a Master’s Degree worth of urban design and policy books and still not get a clearer view of what makes a city vibrant than by reading …. Death and Life of Great American Cities discusses the impact of short blocks, sidewalks, zoning and government money on how cities stay relevant. If policy makers in Trenton had read the book we wouldn’t have had the Canal Banks urban renewal, the Rt. 29 cutting off the river and our former downtown walking plaza. There are small things we can do to fix our city but we have to be on the same page as to what works. 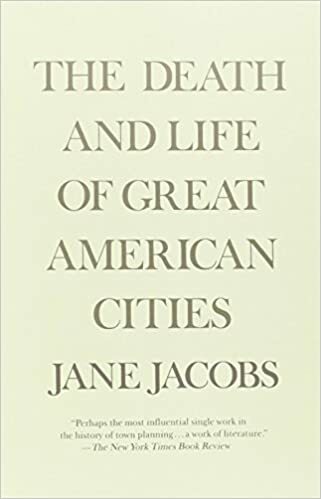 Jane Jacobs’ book is 600 or so pages that all of us need to understand. There are plenty of books out there but these are the two of the most well known and arguably the best books you can read in their respective areas. We need everyone in Trenton to be as well educated as possible about urban planning and economics as we help our government wrestle with our problems. Short of everyone being that well-read, maybe the inquisitive and activist readers of Reinvent Trenton can be. Good post. Hopefully, I’ll get to “Death” eventually. I’d also like to recommend “Rise of the Creative Class” and, based on David Brooks’s last article, “Triumph of the City.” I cut and paste the relevant part of the article below, which partially sums up why I think more discretionary spending should be channeled downtown. I have to admit, that “Rise of the Creative Class” is a big hole in my urban education. It’s not like I don’t know about the book, but I’ve discussed its main points with so many people for so long, that I feel like I know it. That said, there’s no substitute for reading the actual book. So thanks for egging me and other Trenton readers on to picking it up. And thanks also for point to “Triumph of the City” . I read the NY Times article after a friend, I think it was Jamie Griswold, publisher of Community News recommended it. But again, with your prodding, I’m going to pick up the book.